Alasdair MacIntyre is widely credited with restoring the category of ‘story’ or ‘narrative’ to the forefront of the discussion in meta-ethics. 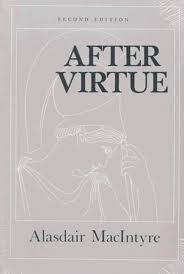 In his influential work After Virtue (1981) he set out his argument for the bankruptcy of most modern ethical theories such as utilarianism and Rawlsian contractarianism and the necessity of recovering an Aristotelian-Thomistic virtue-ethics set within a narrative framework. Among other things, MacIntyre argues that the virtues, those moral practices and habits that characterize the just person, only make sense within a narrative framework because all human action is essentially historical in character–it is historically-enacted and historically-motivated. That is an inescapable feature of human life–whether pagan, post-Enlightenment liberal, or orthodox Christian, we live out of the stories and narratives we tell ourselves. Even the most postmodern among us, suspicious of the various master narratives told to us by modernity, are still living in the sort of story that includes moderns trying to control us through master narratives. Indeed, it is commonly suggested that instead of the idea of the “worldview”, a narrative-identity is a more useful conception for understanding the comprehensive perspective through which we approach moral action in the world. Now, none of this is all that new. Why bring it up? Simply to introduce a few loosely connected quotes and notes on the importance of narrative for Christian reflection on the moral life that ought to be kept in mind. One is cautionary, the other couple are complementary and, after thinking on them, can be classified under the rubric of Creation, Sin, and Redemption. We cannot object to the idea that history should be taken seriously. A Christian response to historicism will wish to make precisely the opposite point: when history is made the categorical matrix for all meaning and value, it cannot be then taken seriously as history. A story has to be a story about something; but when everything is a story there is nothing for the story to be about. The subject of a story must be something or someone of intrinsic value and worth; if it is not, the story loses all its interest and importance as a story. The story of what has happened in God’s good providence to the good world which God made is ‘history’ in the fullest sense. But when that world is itself dissolved into history…then history is left without a subject, so that we have no history any more, but only…’process’. And then again, the story of the world as Christians have told it has its turning-point in the saving act of God in Jesus Christ. Through that crisis it is uniquely determined towards its end. But when every determination to every end is understood equally as a determination to the end of history, the critical moment of the story is lost, the turning-point forgotten. O’Donovan is getting at the point that creation, as a whole and in human natures as created, is the necessary pre-requisite for history as the stage of moral action–it is the set-up. Unless the human being is a certain sort of thing before the action, and the world is a certain kind of place, the things that happen within it lose their meaning. Without creation as the “theater of God’s glory”, to use Calvin’s phrase, there can be no drama of redemption. I spoke earlier of the agent as not only an actor, but an author. Now I must emphasize that what the agent is able to do and say intelligibly as an actor is deeply affected by the fact that we are never more (and sometimes less) that the co-authors of our own narratives. Only in fantasy do we live what story we please. In life, as both Aristotle and Engels noted, we are always under certain constraints. We enter upon a stage which we did not design and we find ourselves as part of an action that was not of our making. Each of us being a main character in his own drama plays subordinate parts in the dramas of others and each drama constrains the others. In my drama, perhaps, I am Hamlet or Iago or at least the swineherd who may yet become a prince, but to you I am only A Gentleman or at best Second Murderer, while you are my Polonius or my Gravedigger, but your own hero. Each of our dramas exerts constraints on each others’s making the whole different from the parts, but still dramatic. MacIntyre also begins to show us the way this false sense of authorship leads to conflict with our neighbors. At the end of the day, in our arrogance and pride we are convinced that we are both the author and the main character in the epic which everybody else plays a bit part or supporting role. Most conflict comes when you find out that the story doesn’t revolve around you, or when you clash with your neighbor because he’s trying to accomplish his own heroic ends at your expense, and not playing the bit role you’ve assigned him. What else should we expect when two sinners, who’ve rejected any acknowledgment of the true Author or story-line, begin to encounter the “constraints” imposed by the dramas of others? From the beginning Christianity was certainly a life. But how was the life produced? It might conceivably have been produced by exhortation. That method had often been tried in the ancient world; in the Hellenistic age there were many wandering preachers who told men how they ought to live. But such exhortation proved to be powerless. Although the ideals of the Cynic and Stoic preachers were high, these preachers never succeeded in transforming society. The strange thing about Christianity was that it adopted an entirely different method. It transformed the lives of men not by appealing to the human will, but by telling a story; not by exhortation, but by the narration of an event. It is no wonder that such a method seemed strange. Could anything be more impractical than the attempt to influence conduct by rehearsing events concerning the death of a religious teacher? That is what Paul called “the foolishness of the message.” It seemed foolish to the ancient world, and it seems foolish to liberal preachers today. But the strange thing is that it works. The effects of it appear even in this world. Where the most eloquent exhortation fails, the simple story of an event succeeds; the lives of men are transformed by a piece of news. The Christian call to repentance is not simply a challenge to live differently or adopt some new moral principles. It is fundamentally a call to embrace the drama of redemption that God has authored in Christ as a new story to live by–and that only happens as the Holy Spirit enlightens our hearts through the preaching of the Gospel. Preaching aimed at real transformation can never degenerate into mere moral exhortation because at the end of the day, the power is in the story.